If you're new here, you may want to subscribe to my RSS feed. Or follow me on the social network Facebook. Thanks for visiting! Living in Algeria, we’re in the ideal junction where three worlds: Mediterranean, Africa and Arab meet. It’s a land of sharp contrasts where we enjoy the Mediterranean climate in the north and exacerbating hot dry Saharan climate in the south. While technically, Algeria has four seasons here, it depends on where you live: the Tell region in the North, the high plateaus, the mountainous ridges or the Saharan desert in the South which makes up about 87% of Algeria. In the Saharan South, there are two seasons: summer and winter. Summer is from May to October and Winter November to April. Temperature changes very quickly because the air is so dry due to the lack of rainfall that heat escapes at night. While the warm winter days might be treat for those used to snow, the temperature drop dramatically after sunset to about 0°C or 32°F. Up in the north, in the Tell regions along the coastline where I live, the seasonal changes are pronounced. Autumn here is radiant and warm. A seemingly never-ending indian summer, if you will, lasting long after October, sometimes into November. Then in winter, periods of rain alternate with warm, sunny days. We know that after three days of howling winds and monsoon like rain, when we all close all windows, try to stay inside and appreciate the solid walls of the house. I was one to (have the time) to really take notice of the seasonal changes, let alone appreciate about them. But I’ve come to crave the changing of seasons, each season brining new elements of surprise to the landscape. But one thing I really do miss the turning of the land and trees from green to hues of red, orange and brown. I, like many, living along the northern coast, rejoice after a long Indian summer when the air cools. Today is a pitch perfect Winter Mediteranean day: it was chilly, rainy and cloudy. 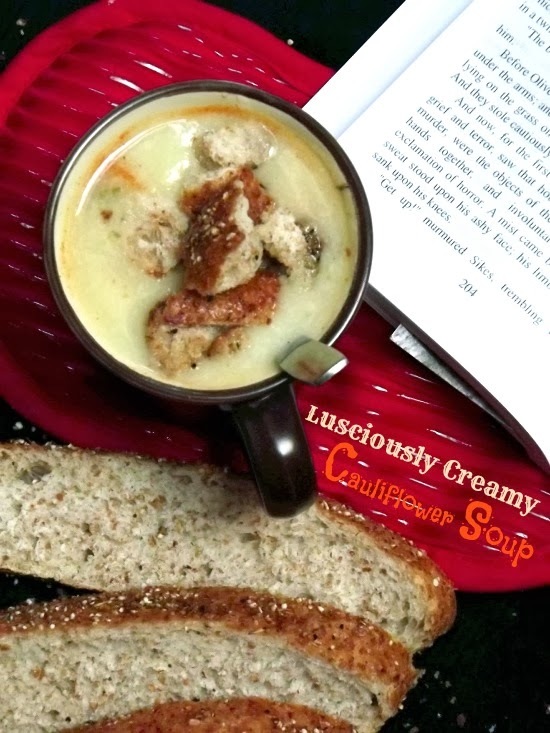 Of course, I celebrated by putting on thick woolly socks, making a big pot of this warming soup and curling in up with a good book. This soup is one of my go-tos. The base of this soup is simple, light yet creamy, and slightly sweet. I’ve made it several times with slight variations trying to see which I liked best. Most of the time, I just top it with homemade buttery garlic croutons. But sometimes I serve it with a side of Gruyére grilled cheese and called it dinner! Other then the flexibility of this soup, another thing I love about this soup that is no roux or cream added, the silky texture is simply from pureeing it. No extra calories at all! I usually use chicken broth, but you can use chicken bouillon cube or even water. Use whatever works for you – there are no rules here. I guess that’s what real comfort home-cooking is about. The thickener I've used in this soup is arrowroot. Arrowroot, also known as tapioca starch or “the obedience plant,” is a large perennial starch plant underground creeping rhizome belonging to Marantaceae family plants. It is widely cultivated in the rainforest habitats like the Philippines, the Caribbean islands, and South America. Arrowroot is very low in calories, and like roots and tubers, arrowroot too is totally free from gluten. If you can't find arrowroot, you can easily subsitute cornflour (corn starch, maizena) in this recipe by diluting 1 TBS in exactly 1 TBS water. Or even forego, the thickener if you find the soup's consistency is to your liking. Lusciously creamy, low in fat, carbs and naturally gluten and grain free this soup is a prefect winter warm up. You can garnish this soup with some snipped fresh chives, chopped parsely, dopple of sour cream, sprinkle of curry or smokey paprika or as I have with (homemade) buttery garlic croutons. WASH and core the cauliflower, then coarsely chop. Set aside. I usually use the core but you can toss it if you like. HEAT a large deep sauce pot, adding the oil and butter, sauté the onions until they're soft and golden, about 5 minutes. ADD the cauliflower and remaining ingredients, then add the broth. Bring to a boil, then reduce to a low simmer, cook covered until the cauliflower is completely soft, about 30-40 minutes. MIX the arrowroot with one tablespoon of hot water. Make sure the arrowroot is completely disolved. Add into the soup and stir. The soup should thicken up in about a minute. Remove from heat — overheating will break down arrowroot’s thickening properties. Remove the bay leaf. Taste and reason the soup, if needed. Puree the soup in a traditional blender or with an immersion blender. 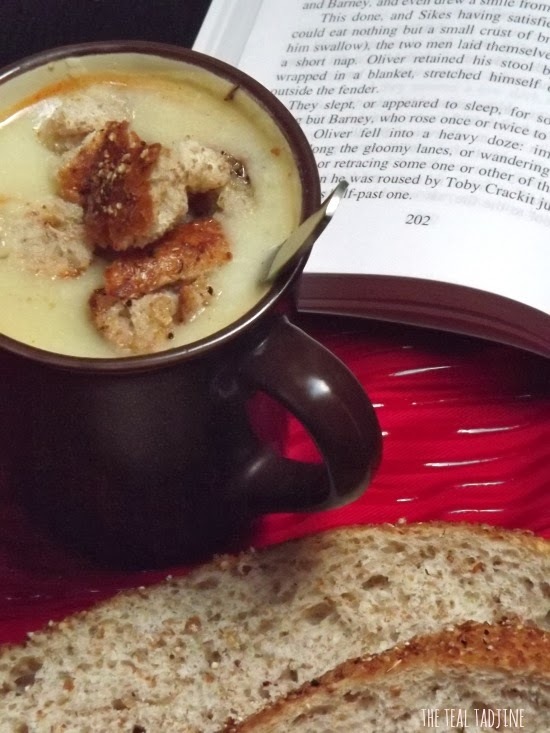 Ladle the soup in bowls or even mugs, garnish with homemade croutons. Eat warm. This soup can be made in advance then stored in the fridge for up to 3 days, or frozen for up to a month. To serve, simply heat up on the stove top for about 10 minutes. It's also portable, just ladle in a thermos to keep warm. This soup is naturally gluten and grain free. You can alternatively thicken the soup with corn flour (corn starch, maizena) if you don't have arrowroot. And for the topping, use croutons made from gluten free bread. For super fast meal, place all the ingredient, except the arrowroot + water in a pressure cooker. Screw on the top tightly and let it cook on a low fire for about 15 minutes. Carefully remove the lid and puree the soup to your desired consistency.